How to get quick promotion or salary rise? Well if you are stuck with current job position and seeking help to get quick promotion this tips can help. 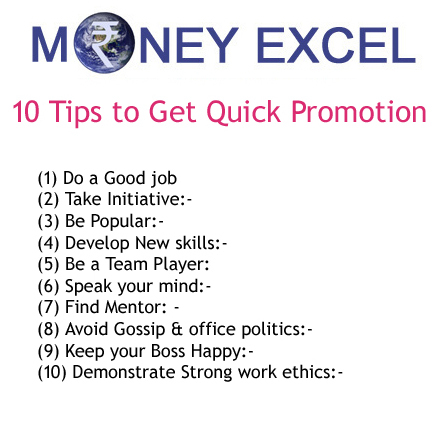 We are herewith 10 effective tips to get quick promotion & salary rise. Well your skills, reputation, experience, ethics & filed knowledge are important factors that will help you to secure promotion & salary rise here are some tips and advice in same direction. How you are performing in your current position & work profile that is extremely important. You must consistently perform better in job assign to you apart from this you must get noticed by top management. 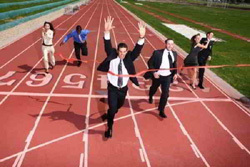 In order to get quick promotion you have to do something extra by taking new initiative. Show initiative by volunteering for projects, either within your department, on a cross-functional team, or a temporary job detail. Don’t stick to your job description. Do something extra. This will help you to get quick promotion or salary rise. Ideally promotion are given on merit but in today’s world apart from merit people skills are also important you have to develop relationship with people. Do attend parties and get-together this will give chance to be more popular. You should acquire or develop new skills. When you demonstrate new skills your employer may feel that keeping you at same position is waste of talent and it boost your chance to get quick promotion. You should act as team player by helping other in doing their job. Always offer help to boss and coworker as and when required. As a team player you are increasing your chance to get good rewards. Discuss with your boss about your career plan and goals preferably goal attainable in your company. Share your accomplishment with your boss. Remember boss is your first friend in your organization. Find your mentor to whom you can speak openly & honestly about work related issues. Your mentor should be senior enough to give you correct advice. Strong mentor can teach you lot of things and it will open new doors for you. You must avoid gossip and office politics. Know the players, respect the players and even form appropriate alliances, but be careful how you play the game watching from the sidelines or from box seats is far less dangerous and can be profitable. Another success mantra to get quick promotion is keep your boss happy. Always complete job in time. Your boss should never complain about you & more importantly you should be asset to your boss and your organization. Deliver your job accurately & timely. Demonstrate strong work ethics and integrity. You should be dependable resource in your area. If you like reading this article, do share it with your friends on facebook and twitter!